A drifter with a long and winding road behind him rides into town astride his noble steed, looking to settle old scores and rebuild what bits of his old life that he scrounge together. Ridgetown stands as one of the last bastions of civilization in the days following “The Quench”, when magic became the rarest commodity there is. Kept safe from its foes by the threat of the mighty Doomlauncher, led by the wise and just Mayor Whunda Satlark, Ridgetown is in need of a hero. A doer of deeds & righter of wrongs. After a sabotage most foul, the city is in need of iron with which to craft ammunition for the Doomlauncher before an impending attack led by a cruel bandit clan. 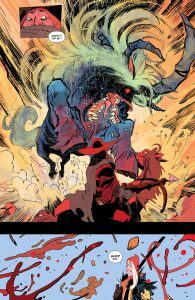 The danger is dire indeed, as the bandits boast the support of none other than Thundergog, last of the giants. It will take a hero true and mighty of heart for Ridgetown to survive. Luckily, just such a hero exists. Maybe… somewhere… okay, probably not. Nomad. 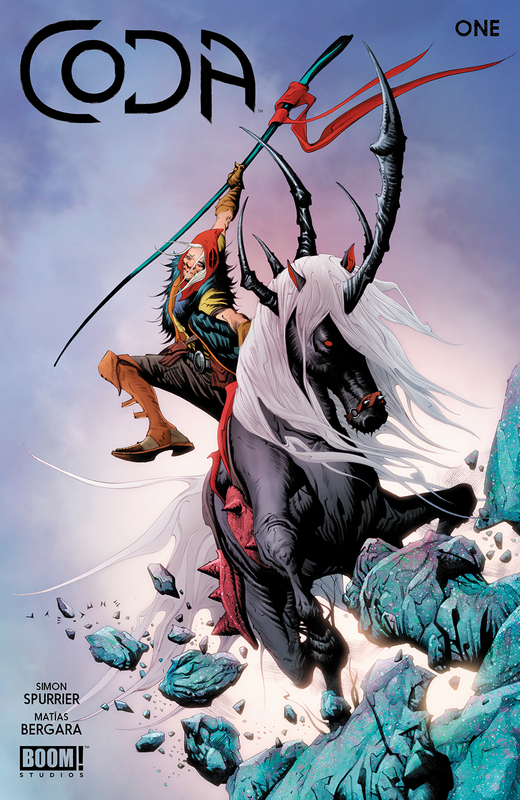 Vagabond… Call him what you will. 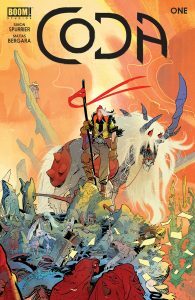 The story of Coda is told, in part, by the man known as “Hum” (“I’m sorry, I didn’t get your name, Mr….” “Hmm…”). 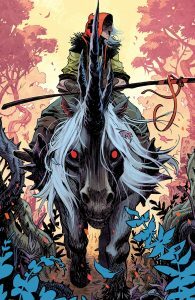 His “mighty steed” is a rabid pentacorn (aka: “stabbyhorse”), and his narration in the form of an ongoing letter written to his lost wife, Serta, tells much of the tale. Granted, Hum’s perspective comes from a man who’s traveled, seen tragedy, and over time has come down a bit on the cynical side. Cynicism aside, Hum will accept Mayor Satlark’s proposal, join the ranks of the heralded Paladins of the Peaceguard, and return to Ridgetown with the metal they need to arm their weapon. Sorta… Maybe… okay, not really. Let’s just say that “Sir Hum” has a more personal mission that takes precedence over everything else, and he will stop at nothing to see it through. The odds are heavily against him, but with determination, grit, and a healthy dose of double-dealing he will push through anything or anyone in his path. He will see his wife returned to him, and he will bring the pillars of the world crashing down around him to get it done. Seriously, that part’s pretty much the heart of this story. 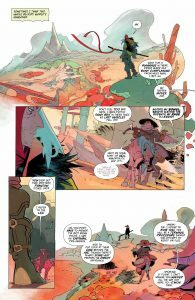 Simon Spurrier is a master at world-building. 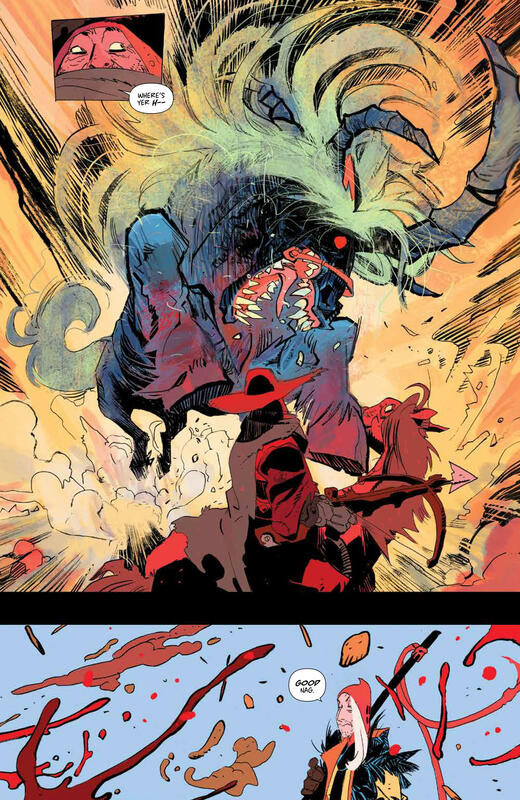 He did it in Six-Gun Gorilla, again in The Spire, and now for Coda. Spurrier’s gift as a storyteller is that he’s able to introduce an established reality, full of history and tragedy, without having to take the time for lengthy explanations. Instead, he lets the story tell itself in its own time, giving his reader just enough context to fill in the blanks for themselves. 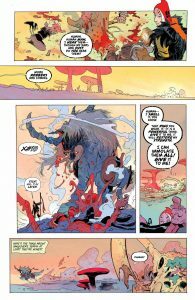 He doesn’t so much show us the world or its origins as he leaves enough unsaid to allow readers to create their own visions of what that world might be. It’s a talent that isn’t always present in a writer, even among some of the best, and it isn’t always essential for telling a good story. Look at all of the detail authors like Stephen King will put into their work, filling page after page with backstories and details so that the audience is able to picture the writer’s vision. 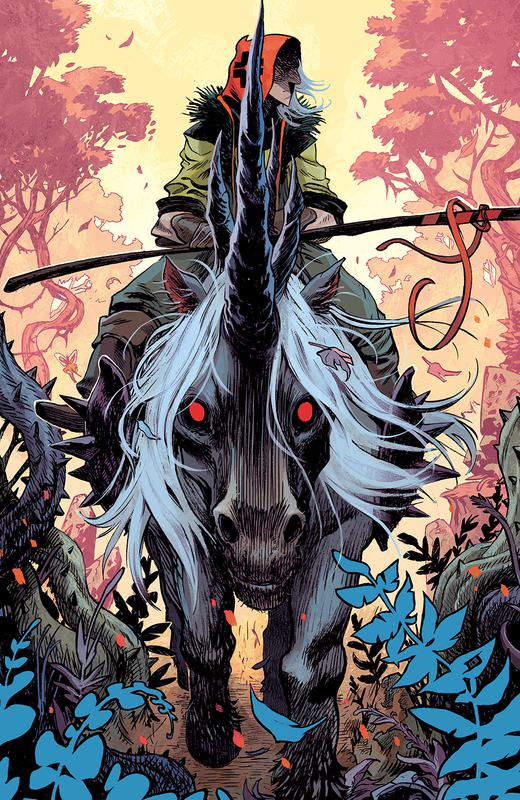 By taking a different route, Spurrier is able to get down to his story, freeing himself of some of the extraneous heavy lifting and trusting in his readers (that would be us…) to create the world living beyond the panels of his comicbooks. Another thing that Spurrier does very well is introducing characters- not necessarily heroes in the strictest sense- who are rarely what they immediately appear to be. In the case of Sir Hum, readers are presented with a selfish, opportunistic, broken shell of a man. He writes to his wife Serka to express all of the things he’s unable to tell her personally. In his cynicism, he refers to the noble Knights of the Peaceguard as “pinheads in plate” and goes to great lengths to use and undermine them for his own ends. He expresses disdain for any act even remotely selfless or gallant, but will shield a beggar child with his own body in the face of danger. It’s in between those lines that Spurrier has crafted his protagonist without putting all of it into print. The shattered world left behind after the cataclysm known as The Quench is one of bizarre landscapes populated by talking skeletal dragons (immortality isn’t so great when your flesh has rotted away), fearsome Urken (big ogre looking dudes), and people of all shapes and sizes. 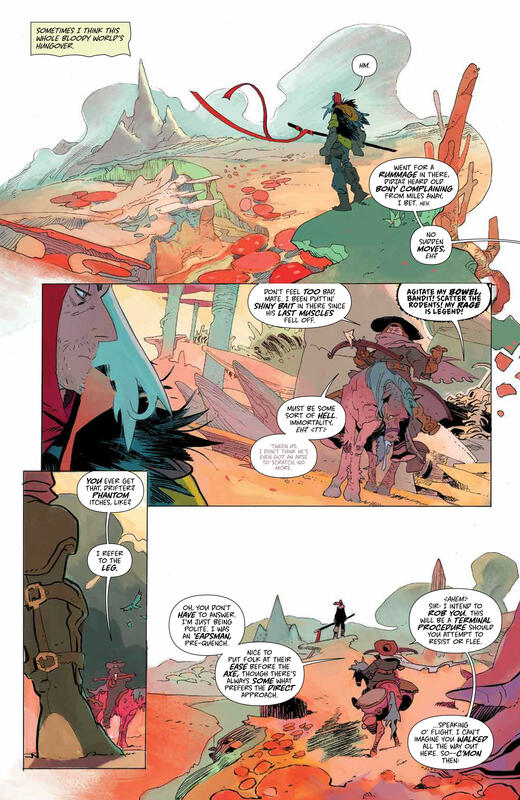 It’s an impressive bit of world-building that would be tough to squeeze into a forty page comic if not for the artistic talents of Matias Bergara (Coda’s co-creator and illustrator) and Michael Doig (colors). 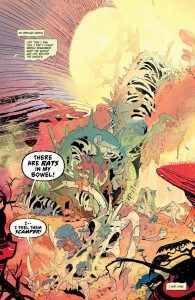 Bergara’s talent for presenting shattered landscapes, gorgeous vistas, and fascinating creatures is displayed here to full affect. 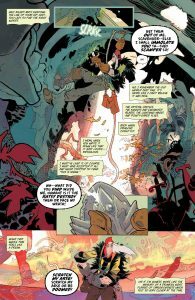 At times his panels may seem chaotic and cluttered, but when it comes down to it, he’s crafting the visuals for a pretty damned chaotic world. 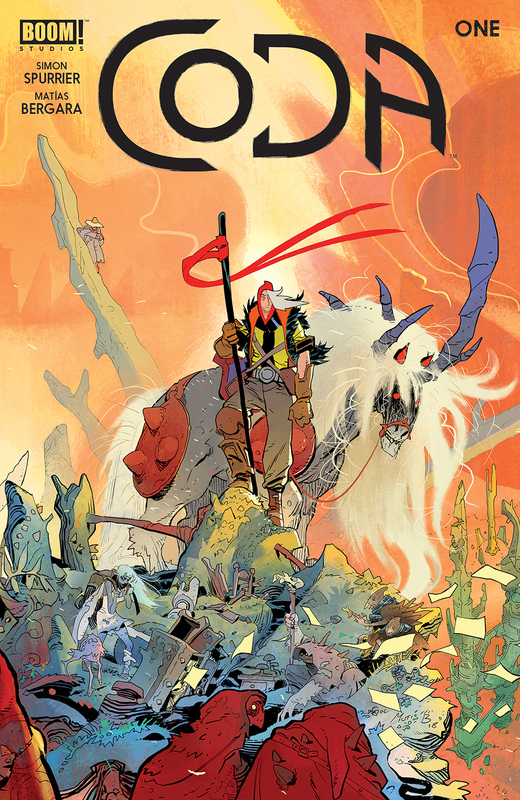 For that matter, Michael Doig’s work in the colors for Coda go a long way toward fleshing out that world. His work flows from aforementioned shattered landscape to gorgeous vista, using colors and blending techniques to create the sense of each background, lending visual cues that leave no doubt as to what kind of environment we’re currently engaged in. 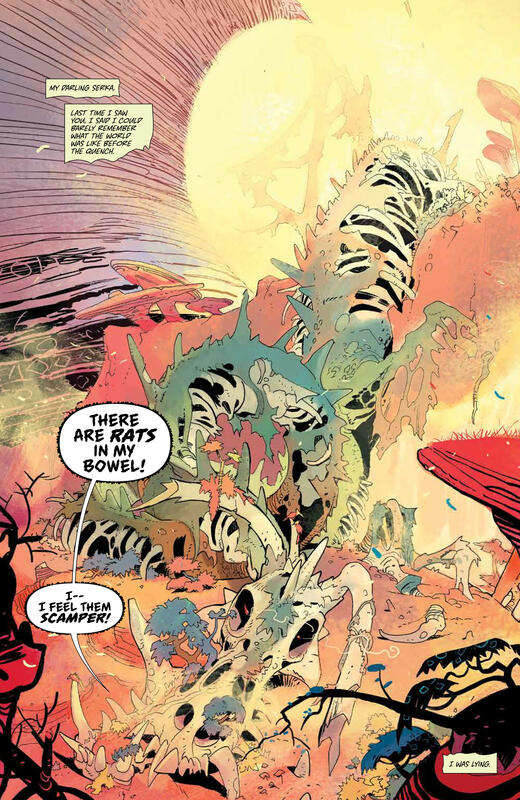 One last factor in the equation of Coda’s visual qualities is going to the unsung heroes of comicbook creation: the Letterer. 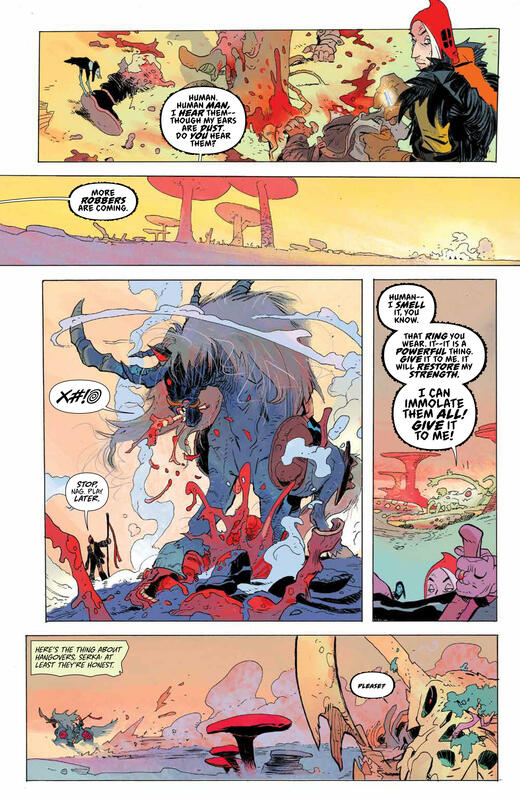 Colin Bell’s work here is as much art as anything done by Bergara and Doig. Before reading Coda, I don’t know that I would have had a clue as to what a whisper would look like on the page, or seen a need for the use of different fonts from one character to another- a need which comes into play when reading the interplay between a noble, maybe somewhat dim-witted paladin, and the sharp-tongued Hum. 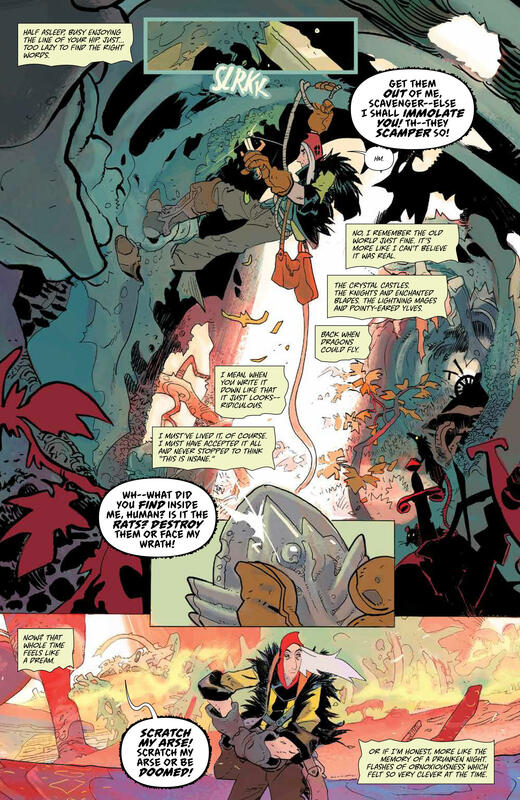 I think the biggest feather in Bell’s lettering cap would be in the way he integrates sound effects into the actual artwork of any given panel: “BAM”, “BOOM”, and “KOOM” are actually worked into what’s been drawn to represent a series of massive explosions, while a well-placed “tchak” lends a bit of squish and spurt to a stabbing victim. I don’t really think I need to express my final thoughts on Coda. I’ve rambled on long enough and you’re apparently still here. So go on. Get the book, read the book, and if you’re so inclined I encourage you to write me back and tell me… convince me… how completely wrong I am about the book.